SIPStation has always had a goal of being simple to understand and easy to use with FreePBX. When we acquired SIPStation along with FreePBX at the end of February the basics were there. You could buy trunks and DIDs, plug in a keycode into your SIPStation module and be up and running in minutes! That part hasn’t changed but we’ve been busy since day one doing everything from adding proper phone and ticketing support to overhauling and upgrading the infrastructure and data center locations to adding new features and functionality to the service. One of our goals is to make your phone service experience as streamlined and integrated as possible into everything else that you do within FreePBX. The current SIPStation module has provided easy configuration functionality by putting in a keycode obtained from your account. 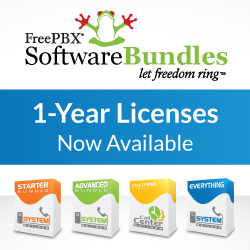 The new version, available for beta testing now with FreePBX 2.11, adds much more! Each SIP account requires an e911 address to be registered with the account. A single DID is chosen to be your “Master” e911 DID. If you call 911, we will transmit that DID as your Caller ID to the e911 dispatch regardless of what you send us. the “Set E911” option on the DID, add the address information, agree to the terms and submit it.If you want a different DID to be your master e911 DID, such as the main receptionist phone number, once e911 enabled, simply choose the option to make that DID your master. You can do this to any of your SIPStation DIDs and we’ve priced the service very reasonably, at just $1.95/month for each additional location you have enabled for e911! The Additional E911 Addresses link provides more information including how to enable a second site that has multiple extensions and multiple DIDs with just one additional e911 enabled DID. In addition to these integrated SIPStation features, the module will automatically add routes to a brand new system that has no routes configured. If there are routes configured, a push of a button will allow you to add these routes in addition to your existing routes. In the old SIPStation module Incoming route configuration for each DID was limited to User Extensions, or you had to go to the normal inbound route section of FreePBX to route to other destinations. The new module allows you to pick any destination on your system, right from the SIPStation page! If you would like to try out the new module and are running FreePBX 2.11, you can download it from our mirror site here. It will be available on 2.10 as well when we release. Issues can be reported to SIPStation support or directly in the FreePBX issue tracking system.